Callie’s Memory has an orange salmon color with a dark heart and is a semi double Intersectional Hybrid. 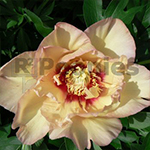 With the soft smelling flowers is the Peony recommended for gardens and city parks all over the world. Callie’s Memory is rich of flowers, reaching out of the dark foliage. This intersectional has an excellent use for solitaire planting as well for large groups planting. Callie’s Memory stays beautiful even after the blooming period. The green foliage changes in beautiful Indian Summer colours in the fall.